Arduino Mega compatible! 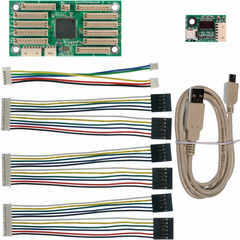 This bundle includes USB-serial-adapter, serial-to-DragonFly cable and three 11-pin IO cables. The schematic and signal reference chart are downloadable below. This ATmega1280 based controller board features 128K of flash for your most demanding applications. Measuring only 80mm x 40mm, the board is smaller than a credit card and two of these boards can fit in the palm of your hand. We pinned out all 86 of the IO pins on this chip (but only 56 are used by the Arduino Firmware). The board features an on-board 16MHz crystal. The board is powered by either and external 5V or 3.3V power source. 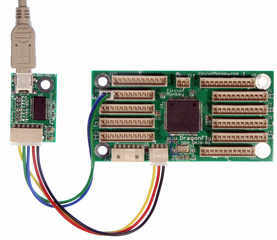 It features 11 8-bit I/O ports (only 6 on Port G), a 6-pin ISP RobiCon connector for programming (adapter optional) as well as a Molex 3-pin power connector (the third pin is reset). We are working on a kit that will make this board software compatible with Arduino Mega (which uses the ATmega1280 chip). Our kit will include the board with Arduino firmware already loaded as well as a USB/Serial adapter. We've also got Arduino running on the 2560 model and submitted the source code changes to the Arduino community. For now we will pre-install Arduino firmware upon request. This board is also available in a "Naked" Edition, lighter, thinner, and no connectors soldered in.